Today’s Topic: How Has the Offensive Line Looked This Spring? 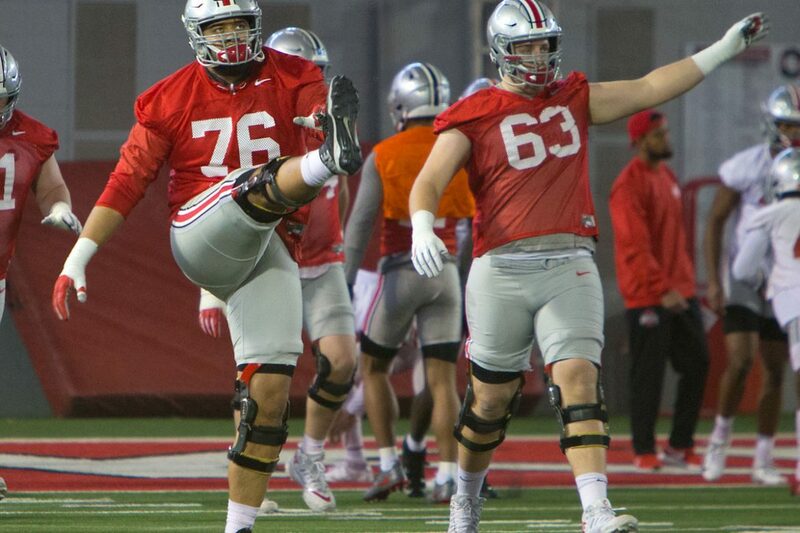 This has been an interesting and undermanned spring for the Ohio State offensive line. Four starters are gone from last year and the fifth starter — junior left tackle Thayer Munford — has been out all spring with a back issue. Some of the current linemen have missed time with illness, but that has allowed fifth-year senior Branden Bowen to move around and show his worth. Fourth-year junior Gavin Cupp has been with the ones all spring at left guard, giving the unit some upperclassman experience. Josh Myers, a redshirt sophomore, has handled the center position well, and good things have been said about his backup, redshirt freshman Matthew Jones. Redshirt freshman right tackle Nicholas Petit-Frere has had the benefit of staying put, which has allowed him to impress head coach Ryan Day. Overall, the line has had some very good moments, and the reinforcements coming this summer are only going to make it better. While the line has not been at full strength for much of spring camp, the experience gained by so many will be beneficial come summer and then preseason camp. The new players arriving this summer include Rutgers transfer guard Jonah Jackson, 5-star center Harry Miller, and his classmates Enokk Vimahi and Dawand Jones. Thayer Munford should also be back and ready to go for camp as well. As for this Saturday’s spring game, however, the offensive line is going to be a concern. With 11 healthy-ish bodies split over two teams, expect some jersey swapping to go on, as well as some fast ticking. “We really have 11 guys total, so that’s going to be a huge part of it,” Day said. “And because we’re a little thin there, we want to be at 16 scholarship guys, and we’re light right now. And obviously with Thayer being out, that’s a big deal, so it’ll be hard. If there’s a legit concern about the team this Fall, it’s the O-line and QB and O-line looms larger both physically and for the team because zero yards are gained w/out them. O line is the most important component of the offense – it makes great QBs, receivers, & RBs. The strength & depth of the Buckeye O line is a concern right now – they may be great or they may be mediocre – probably somewhere in between.